Q: Why should I give to United Way? A: When you give to United Way, you help provide solutions to the most critical human care issues in our community. You become part of a coordinated, community-wide effort that brings about the changes that matter most where you live and work. United Way of Lee County maximizes your gift by combining your contributions with others and strategically investing in results-driven programs and initiatives. Giving hope to kids, families, seniors and people with disabilities, you help our entire community. Plus, with the ease of payroll deduction, you can help others and improve the quality of life in our community without the financial challenge of a one-time donation. Q: What does United Way do in addition to raising money? A: Fundraising is just one part of the immense value United Way brings to our community. By partnering with businesses, government, non-profit organizations, and individuals, we help improve lives and create sustained change in our community. United Way of Lee County also monitors our area’s changing needs and focuses resources to provide quality solutions. Q: Is United Way a national or local organization? A: United Way of Lee County is a local, autonomous non-profit organization. Like the more than 1,200 United Ways across the country, we are governed by a local volunteer board of directors. 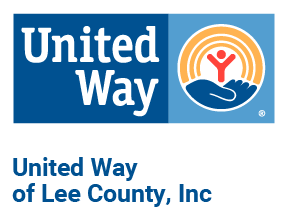 United Way of Lee County pays nominal dues to United Way of America in exchange for important cost-saving services such as staff training, community research information, campaign products and ongoing consultation. Q: Why does United Way have administrative costs? A: In the business of community impact, United Way of Lee County incurs costs for fundraising, marketing, year-round support of our fundraising and agency partners, community investment and common business operations such as accounting, human resources and overall organizational management. As careful stewards of our donors’ investments in our community, we operate our organization with the utmost efficiency and effectiveness. Ninety-nine cents of every dollar is invested in local programs and initiatives that improve lives and deliver results. Q: How is United Way of Lee County held accountable? A: The most valuable asset we have is the trust and confidence of our donors and the community. United Way of Lee County has a volunteer committee which oversees our organization. We maintain high standards and are scrutinized each year by an independent auditor, who ensures that our fundraising procedures remain the most efficient and cost-effective. We strive to meet the philanthropic goals of our donors. Q: How do I know that my donation will help those who need it most? A: Trained, knowledgeable community volunteers carefully invest United Way contributions in local programs. This group of dedicated volunteers ranges from community volunteers to business leaders. They carefully monitor community needs, meet with local health and human service agencies, review each agency’s requests for program funding and invest your contribution in programs that do the most good in helping people in need. Q: Is my United Way contribution tax deductible? A: Yes, your contribution is tax deductible. Q: Why should I give to United Way instead of directly to an agency? By investing in United Way of Lee County, you help provide solutions to the most critical human care needs of our community. You don’t have to choose which need is most important, United Way addresses them all. Community volunteers carefully review each United Way funded program on an annual basis. Their oversight ensures agencies adhere to sound fiscal policies and that your contribution is invested in programs that do the most good. Click here for Agency Membership Requirements. Giving through United Way reduces costly and time-consuming fund-raising efforts for the agencies providing programs. This enables them to better spend their time helping people who really need help. When you give through your workplace campaign, your gift can be spread out over the course of a year through payroll deduction, making it easier for you to support the human care needs of our community. When you give to United Way of Lee County, your gift is invested with the contributions of others to help provide a continuum of care for those most in need. This enables you to partner with us in creating sustained changes in community conditions that improve the lives of individuals throughout our area.